French President Emmanuel Macron has sought to justify paying homage to Nazi collaborator Philippe Pétain during centenary commemorations marking the end of World War One later this week. Mr Macron said Marshal Pétain was a “great soldier”, even though he had made “disastrous choices” during WW2. 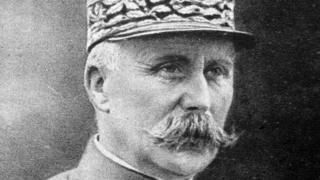 Pétain was praised for the defence of Verdun in 1916, but he was sentenced to death for high treason after WW2. Some French politicians and Jewish leaders condemned Mr Macron’s comments. And referring to Pétain, Mr Macron said: “He was a great soldier”, although he had made “disastrous choices” during the Nazi occupation of France. Petain co-operated with the Nazi invaders and headed a puppet government centred on the spa town of Vichy. Mr Macron’s office later defended his comments. “I’m not forgiving anything, but I’m not going to erase anything from our history,” he said, stressing that Pétain was “complicit in grave crimes”. On Saturday, a ceremony will be held in Paris to commemorate the eight marshals – including Pétain – who led the French army in WW1. What has been reaction in France? A number of French politicians criticised President Macron. Left-wing leader Jean-Luc Mélenchon, who leads the France Unbowed party, described Pétain as “a traitor and an anti-Semite”. Meanwhile, Francis Kalifat of the CRIF association of French Jewish groups said he was “shocked” by Mr Macron’s comments praising a Nazi collaborator who helped send thousands of Jews to their deaths. “The only thing we will remember about Petain is that he was convicted, in the name of the French people, of national indignity during his trial in 1945,” Mr Kalifat said. He was born in 1856, and joined the French army 20 years later. Pétain was seen by many in France as a national hero for restoring army morale after Verdun – the largest and longest battle in WW1. In 1918, he was made a marshal of France. In 1940, with France under attack from Germany, Pétain was appointed vice-premier. He later asked for an armistice, upon which he was appointed “chief of state”, enjoying almost absolute powers. The armistice gave the Germans control over the north and west of France, including Paris, but left the remainder as a separate regime under Pétain. Officially neutral, in practice the regime collaborated closely with Germany, and brought in its own anti-Semitic legislation. After the end of WW2, Pétain was arrested and sentenced to death for high treason. This was then commuted to life imprisonment given his age. Pétain died in 1951 at the age of 95.